Pride mobility products are globally recognized as some of the best manufacturers, designers and developers of power chairs, scooters and lift chairs. For people with mobility impairments, the power chair Pride iLevel features a revolutionary design and upgraded experience. As a mobility products company, Pride stands out for their expertly designed, engineered and tested products, such as the power wheelchair Pride iLevel. The world is not designed around seated height, so wheelchair users can often find themselves excluded from daily activities and interactions that stand beyond their physical reach. Thanks to the power wheelchair Pride iLevel, people with mobility impairments can experience a greater quality of life and daily functionality. Making life safer and more enjoyable, users can operate the power wheelchair Pride iLevel with the seat fully elevated, while going at a walking speed (up to 4.5 mph) allows them to enjoy greater social interactions and access to common areas of the home. Its patented Extra Stability Technology makes transfers, reach, and many other daily activities much safer. And its specialized design makes for a much more comfortable experience that allows user to make fine adjustments while seated to allow for optimal positioning. The power wheelchair Pride iLevel allows for an up to 50º of tilt and an 85º-175º of recline, with an easily retrofit power tilt and power recline. Easy back height, depth and center of gravity adjustments provides a comfortable ride, complemented with premium accessories, such as a complimentary cup holder and optional attendant controls. 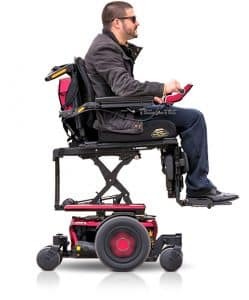 When fully elevated, the power wheelchair can drive up to 3.5 mph and hold a weight capacity of up to 300 lbs, or up to 400 lbs in the Q6 Edge HD Power Chair. As leader providers of mobility products, Orthopedic Service Company offers customers only the best in the market. The power wheelchair Pride iLevel’s enhanced engineering and design makes it one of the most innovative mobility devices you can find. Contact Orthopedic Service Company today and find out more about your options by talking to one of our representatives.